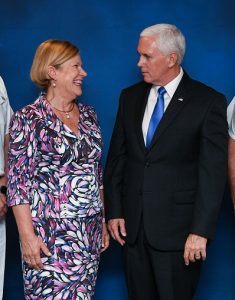 Carnival Australia Chairman Ann Sherry met with US Vice President Mike Pence over the weekend on Pacific Explorer, one of three Carnival Australia-brand ships in Port Moresby to support Papua New Guinea’s hosting of the APEC Summit. Other Asia Pacific leaders including Australia’s Prime Minister Scott Morrison, China’s President Xi Jinping, Russia’s Prime Minister Dmitry Medvedev, PNG’s Prime Minister Peter O’Neill and Malaysia’s Prime Minister Mahatir Mohamad also visited Pacific Explorer for the high-profile APEC CEO Summit. APEC (established in 1989) stands for Asia-Pacific Economic Cooperation – a group of 21 economies in the Asia Pacific Region. APEC aims to create greater prosperity for the people of the Asia-Pacific region by promoting “balanced, inclusive, sustainable, innovative and secure” growth and accelerating regional economic integration. Each year, the APEC CEO Summit draws top business leaders – and sometimes intellectuals and media personalities – for discussions with APEC leaders on expanding trade and investment opportunities. The P&O Cruises flagship Pacific Explorer and sister ship Pacific Jewel along with Princess Cruises’ Sea Princess were chartered for APEC to provide accommodation and conferencing facilities for delegates and international media. On Saturday, Sherry called for opportunities for the region’s reservoir of talented young people when she addressed the APEC CEO Summit during a panel session on the workforce of the future. 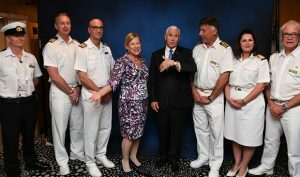 She said Carnival Australia’s experience in cruising to the South Pacific included a commitment to connect cruise tourism to economic growth so that young people don’t have to leave their communities to find work and other opportunities. “Young people represent the future in developing countries in the region and are the ones who stand to benefit most from innovative and disruptive business ideas based on the principles of inclusion and equality,” Sherry said. 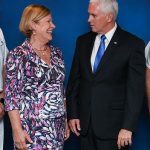 “In this region, we sit in the midst of an amazing potential workforce who currently find it difficult to tap into the formal workforce.